SilkPeel™ Dermalinfusion™ is a new format dermabrasion that provides non-invasive exfoliation and the delivery of skin specific topical solutions under pressure. Unlike traditional technologies that rely on messy crystals or other irritating particles, SilkPeelTM DermalinfusionTM’s diamond tip head evenly abrades the skin at a depth of 30 microns, exfoliating damaged skin cells while delivering targeted topical solutions deep into the skin. An arsenal of uniquely formulated solutions for acne, aging and pigmentation enable the practitioner to customize treatments according to their patient’s needs, offering immediate results with no downtime. A newly developed body wand similarly allows the operator to treat a range of skin types and conditions associated with the body. This clinically-proven concept of skin re-surfacing can be used by itself or as a combined therapy with lasers and other light treatments. Our business has increased by 50% in just two months, and I’ve done no advertising. Patients are sending in friends in droves. Patients see and feel a difference quickly. They feel better right after the treatment and much less “wind burned” or chapped compared to more traditional microdermabrasion. Results are quicker and better for hyperpigmentation, acne and dry skin. Immediate exposure of the abraded skin to the topical solution optimizes the delivery of exclusive high performing topicals for acne, aging and pigmentation. Patient results are maximized immediately and in the long term as part of a continued regime. Results with SilkPeelTM DermalinfusionTM are consistent and the procedure can be performed twice as frequently as traditional microdermabrasions. 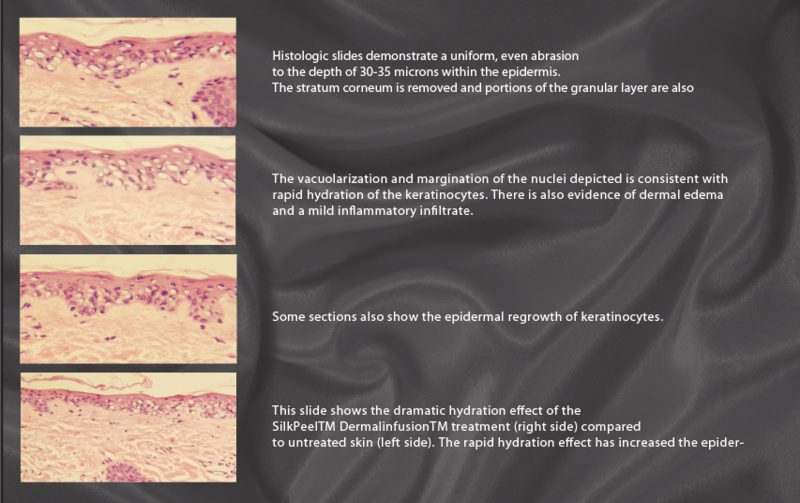 Unlike traditional microdermabrasions, SilkPeelTM DermalinfusionTM enables practitioners to address a variety of skin conditions with a single machine. A range of exclusive topical formulas provide targeted solutions that can be used independently or in combination for ultimate customization. The SilkPeelTM DermalinfusionTM Body Wand provides combination therapy for the entire body. Higher flow settings improve the appearance of cellulite, restore elasticity and provide deep lymphatic massage while lower setting address stretch marks, acne and other imperfections affecting the body’s skin. 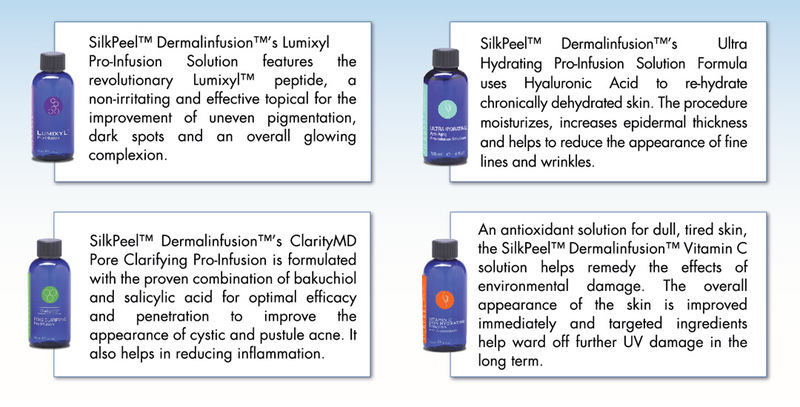 Studies demonstrate SilkPeelTM DermalinfusionTM’s efficacy in the improvement of dermatological conditions.